While Amazon fulfillment centres and other warehouses are full of technology, not all logistics executives and managers are gung-ho about all the automation options out there. Uber and San Francisco-based startup Embark believe they can overhaul the future of freight with self-driving trucks. Starsky Robotics, another San Francisco startup, said they will have driverless semis at the end of this year. Amazon has several enterprising patents for drone delivery, including a drone that recognises human gestures like a thumbs-up or arm waving. 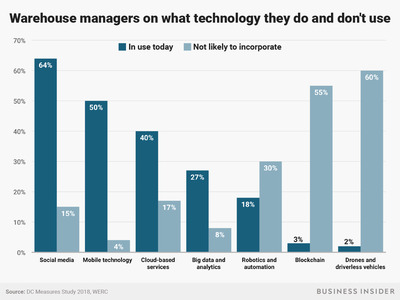 According to a recent survey of 549 warehouse managers, directors, and vice presidents by the Warehousing Education and Research Council (WERC), the majority of warehouse executives aren’t planning on implementing robotics, blockchain, or other emerging technologies. Of the companies surveyed, 70% were worth $US100 million or greater. A $US148.7 billion industry, warehouses are the last stop for nearly all of what we consume before they reach our homes or stores – and they hold much of the raw materials or parts for items before they are manufactured. 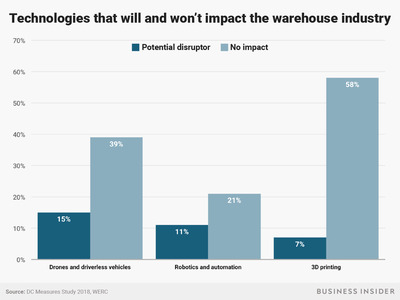 WERC’s report advised warehouses to consider how they will work alongside other supply chain companies that have begun to implement these technologies.